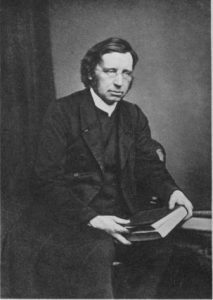 John Mason Neale (1818 – 1866) was an Anglican clergyman and translator of a number of hymns. Born in London his father was a clergyman, Cornelius Neale, and his mother Susanna Neale, daughter of John Mason Good. Neale was educated at Sherborne School, Dorset, and then at Trinity College, Cambridge. Neale translated Eastern liturgies into English, and wrote a mystical and devotional commentary on the Psalms, however, is best known as a hymnodist and translator, having enriched English hymnody with many ancient and mediaeval hymns translated from Latin and Greek. For example, the melody of Good King Wenceslas originates from a medieval Latin springtime poem, Tempus adest floridum. More than anyone else, he made English-speaking congregations aware of the centuries-old tradition of Latin, Greek, Russian, and Syrian hymns. The 1875 edition of the Hymns Ancient and Modern contains 58 of his translated hymns; The English Hymnal (1906) contains 63 of his translated hymns and six original hymns by Neale.